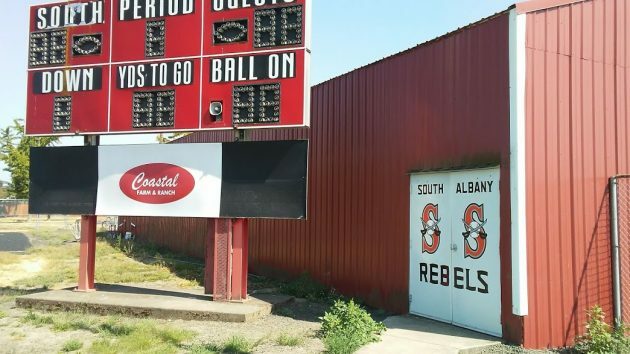 On Waverly Drive, the electronic sign outside the football field was easy to change. 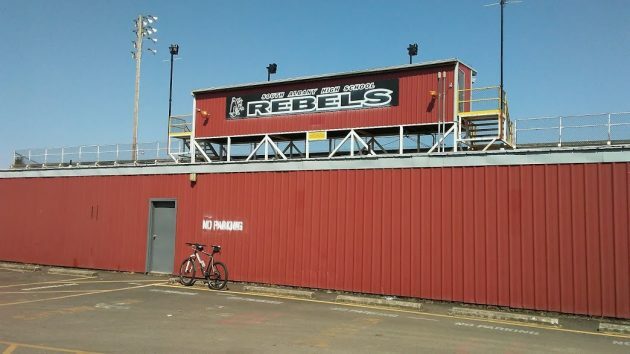 On Wednesday the bike took me to the environs of South Albany High School because I was wondering how far the school formerly known as the Rebels had come in replacing its outdoor signs. As I found out, it has a way to go. 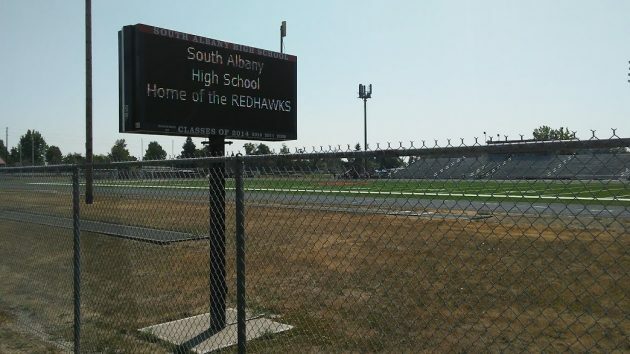 An electronic signboard on the Waverly Drive side of South’s football field shows the school teams’ new nickname, the Redhawks. The name was chosen by the students in the spring after the school administration decided to get rid of the old name and logo because of their association with the Confederacy of 150 years ago. Changing that sign on Waverly was a simple matter. But as you can see, elsewhere around the field, the change has yet to be made. The press box atop the grandstand is still awaiting removal of the old lettering. Same story on the shed doors near the scoreboard. And then there are these hurdles. I don’t know whether those hurdles were stored outside waiting to be disposed of, or whether they are to be repainted and put back in service. 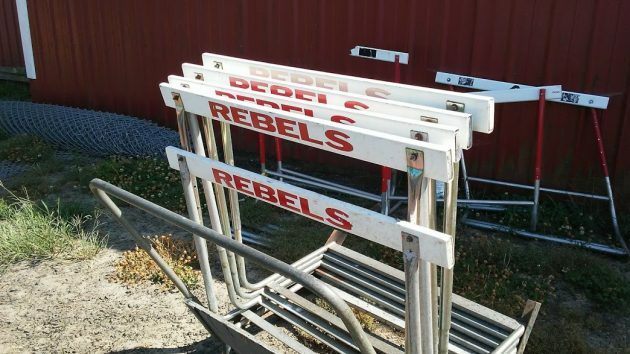 On an online site, a vendor lists hurdles for high school track as costing just over a $100 each. So repainting these would probably be the better solution. Red is not fair to communists or sunburned people and Hawks is not fair to birds or pro military folks ….Transmitted by secure phone from safe space. Now even Albany has surrendered to the infantilization of it’s citizens. I had never come across a Redhawk before though I knew of Red Tail hawks and Red Shoulder hawks. Even spellcheck didn’t recognize Redhawk so I Googled it to see what a Redhawk was and looked like. Redhawk does have a following in company names and, perhaps, sports and marketing images. But I did not find an avian namesake. Of all of the images I like the Ruger RedHawk the best, perhaps because I have a Ruger Blackhawk. So I guess South Albany is free to ascribe what ever physical and character attributes to their Redhawk as they wish. Americans are great at overcoming hurdles. So white and red paint and members of the Senior class can handle it in no time. I happened to spend some time with a South student today. We discussed the name change. Both the process and the financial expenditure to make this change is troubling.The impression I got was that there is no buy in to the change by the students, and when they did get input it got ignored. If I remember correctly the quoted cost to make the change was 129k. It likely will cost that much to change the end zone turf on the football field. At a minimum, you’ve got to change out every uniform on every sports team. Just my opinion, but I think the students feel like the adults running this community sold them out for a moment of political correctness. They should have an auction for the Rebel gear to pay for the new crap. Plenty of alumni would be interested. Redhawk is a pistol. A .44 magnum by Ruger. What do they think of that?